I've been tossing this post around in my head for a while, and true to form as a lawyer, I didn't want to post anything until I had a fully developed view of the proposals. But I've decided to put my economist hat back on, throw out my impressions of the proposal, and then let other people tell me how wrong/stupid my impressions are. Ralph Liu, who apparently created the first yuan-denominated interest-rate swap for Chinese banks, is promoting a financial product called SwapRent to help with the foreclosure crisis. In a SwapRent contract, homeowners facing foreclosure would sell a percentage of the future housing price appreciation to investors in exchange for a monthly subsidy sufficient to keep the homeowner out of default. A homeowner who entered into a SwapRent contract would essentially become a renter, but without giving up legal ownership. The investors would essentially be betting that the value of the house will rise. It's a variation on the shared-appreciation mortgage idea. Housing prices would be determined by a price index, such as the MSA level of the OFHEO HPI. The duration of the SwapRent contract would vary (e.g. 1, 2, 5, or 10 years), as would the percentage of the price appreciation the investor gets. SwapRent contracts would also work the other way: homeowners could protect against declining housing prices by paying an investor a fixed amount to take on the downside risk. This Business Week article provides a nice summary of the SwapRent proposal (read the comments too, as Liu provides lengthy responses to some good questions). For a one-page summary, see here; for a Los Angeles Times article on Liu's proposal, see here. Residential real estate futures and options markets are not new ideas, but they've never been able to attract enough buyers and sellers to get off the ground. SwapRent, however, already has at least one large class of potential buyers: investors holding mortgage-backed assets. If SwapRent could attract enough liquidity, it would not only reduce the number of foreclosures, but would also help stabilize the housing market in the future. If there had been a real estate futures market 10 years ago, the housing bubble probably wouldn't be wreaking as much havoc on the economy as it is today. Ultimately, I'm not sure there are enough homeowners and investors in a position to use SwapRent for the proposal to have a huge impact on the foreclosure crisis. Assume housing prices have to fall another 15% nationally to reach the bottom (a generous assumption, given the most recent data). To make a significant impact on the foreclosure crisis, SwapRent needs investors who are willing to bet on price appreciation. But if housing prices still need to fall 15% to fully correct, then there won't be sufficient price appreciation to attract enough investors for a while. SwapRent would be very beneficial in communities where housing prices have reached the bottom in terms of supply and demand, but are in danger of falling too far due to foreclosures. If investors think housing prices are declining largely because of foreclosures, then using SwapRent to avoid foreclosures would not only stop housing prices from declining further, but would also increase the chance of future housing price appreciation (and thus profit). I could be wrong about the number of buyers and sellers in a position to use SwapRent, and feel free to correct me if I am indeed wrong. I do, however, think SwapRent could provide significant benefits beyond the foreclosure crisis. In the next post, I'll discuss the positive externalities generated by separating the legal and economic ownership of housing. The world's top oil producers are proving unable to put more barrels on thirsty world markets despite sky-high prices, a shift that defies traditional market logic and looks set to continue. Fresh data from the U.S. Department of Energy show the amount of petroleum products shipped by the world's top oil exporters fell 2.5% last year, despite a 57% increase in prices, a trend that appears to be holding true this year as well. There are several reasons behind the net-export decline. Soaring profits from high-price crude have fueled a boom in oil demand in Saudi Arabia and across the Middle East, leaving less oil for export. At the same time, aging fields and sluggish investments have caused exports to drop significantly in Mexico, Norway and, most recently, Russia. The Organization of Petroleum Exporting Countries also cut production early last year and didn't move to boost supplies again until last fall. In all, according to the Energy Department figures, net exports by the world's top 15 suppliers, which account for 45% of all production, fell by nearly a million barrels to 38.7 million barrels a day last year. The drop would have been steeper if not for heightened output in less-developed countries such as Angola and Libya, whose economies have yet to become big energy consumers. The oil price is set in a market. For Shell, Exxon et al to hoard oil underground would be to leave billions of dollars of investment languishing unused. This is true only if the price of oil isn't exptected to rise. If, however, the price of oil is expected to rise, then oil companies would hoard oil underground because they could extract it and sell it for a higher price later. I personally don't think this is happening on a large enough scale to affect oil prices, but I wish The Economist would make sure the author understands the argument before dismissing it in a cover story. Christopher Hayes writing in The Nation. The vast majority of interest groups in Washington, from the Sierra Club to the AFL-CIO to Planned Parenthood, are pursuing what Edsall calls "substantive reform"--attempting to push legislation and enact policies that will provide public goods, protect citizens from harm and redistribute benefits, rights and privileges away from the powerful and toward middle-class citizens and disenfranchised minorities. And if you believe that, might I mention that if you act quickly I have some land in Florida just ripe for development. That's why I limit my regular reading to the Financial Times, National Journal, The Economist, CQ Weekly, etc. Stocks of oil held in deposits underground dwarf those held in inventories aboveground, and the decision how much to produce is subject to the same calculations trading off interest rates against expected future appreciation that apply to inventories. (The classic reference is Hotelling’s Rule.) Apparently the Saudis have decided to leave theirs in the ground. "King Abdullah, the country’s ruler, put it more bluntly: 'I keep no secret from you that, when there were some new finds, I told them, 'No, leave it in the ground, with grace from God, our children need it'.'" (Financial Times 19 May). In other words, instead of extracting oil and storing it in inventories, oil producers are just keeping the oil in the ground. This is certainly a plausible explanation for the case of the missing oil inventories. Paul Krugman has challenged the people who believe there's an oil bubble: "Tell me where you think the excess supply of crude is going." If Frankel is right, the answer would be: Nowhere—it's staying in the ground. Now, I'm not sure if Frankel actually is right, but it's certainly possible that oil producers are leaving oil in the ground instead of storing it in inventories. As a recent research note from the Dallas Fed notes: "So far, new supplies haven’t materialized quickly enough to keep up with growth in world demand." The most popular explanation for the high oil prices is that world demand is rising while supply is stagnating. But suppose that Frankel is right, and that oil producers really are leaving oil in the ground because of the low interest rates. That would mean that some of the apparent stagnation in the supply of oil is just an illusion: oil producers could be keeping up with the rising demand, but the low interest rates are inducing them to keep more oil in the ground, thereby creating the appearance of stagnating oil supply. I'm still not ready to fully buy into Frankel's argument, but it's definitely the explanation I'm rooting for! According to Forbes, UBS has some $37 billion in write-downs on assets tied to bad US mortgages. In other words, the bank's very life appears to be on the line in how the US government chooses to handle the matter. UBS's "very life appears to be on the line"? UBS certainly has a significant interest in whether the US government bails out the housing market, but in no way does UBS's existence depend on a government bailout. Let's assume that UBS takes another $37 billion in write-downs due to the deteriorating housing market. Now, $37 billion in write-downs sounds like a lot (and it is), but when you consider that UBS has roughly $2.2 trillion in assets, it becomes clear that another $37 billion in write-downs won't mean the end of UBS. Also, UBS is not Bear Stearns. In terms of market capitalization, UBS is over 30 times bigger than Bear Stearns was before it collapsed. Don't get me wrong, I think it was completely inappropriate that McCain had a UBS lobbyist advising him on his response to the housing crisis. It's inexcusable for a candidate who portrays himself as a crusader against lobbyists and special interests. This should end Gramm's role as a McCain advisor. But it's not like UBS needed the US government to bail out the housing market in order to remain in existence. I greatly respect Marshall, but I fear that by overstating UBS's interest in a government bailout, he'll take the legs out from under his argument. 1) What is the "fair market rent" to be determined by an "independent appraiser" on a 90% empty exurban development without the legal minimum sales to form a homeowner's association? 2) The tenants may be willing to invest in upkeep, but who fixes the plumbing when it breaks? The servicers are not rental agents. Moreover, they have no legal ability to become rental agents under their contracts. There is no entity in the position to take the role of landlord to these people. This is seen as the biggest--nay, insurmountable--obstacle. The only way this would work is if the government took possession of the homes, i.e. gigantic government bailouts. 3) There will be considerable political pressure on the "independent appraisers" to keep the fair market rental value down, handing the banks a loss. 4) Most of the people with the really problematic loans probably can't afford to rent their house, either. 5) To the extent that they could afford the rents--i.e. that houses were massively overvalued--you're putting a big capital loss on the bank's balance sheet and keeping it there, year after year, rather than writing it off. 6) The worst hit homes are in "developing areas" that are now rapidly "undeveloping", meaning that there aren't adequate services there. Encouraging people to stay in those areas is not, in the long run, a good idea. It also isn't a good idea to make people less mobile during an economic downturn. 7) Some of the worst hit homes are in areas where the tax base will not support the cost of basic services to the developments that the government is encouraging people to stay in. 8) Who gets to vote on the board of the homeowner's association? Are various servicers supposed to send people to represent their interests? Who pays the property taxes? You're sticking banks with a long term asset that neither they nor the servicers are set up to handle at all. 9) Keeping bad assets on bank books for years and years was, many argue, the main factor that made Japan's economy so festive in the 1990s. We should probably not repeat their error. I certainly agree with item 4 -- many people who can't afford the mortgage payments also can't afford the rent -- but I don't think that's a reason to oppose the own-to-rent plan. It just means that the plan will have a limited impact. If a homeowner won't be able to afford the rent, then he won't petition the judge to allow him to stay as a renter. The majority of homeowners who actually file a petition under the own-to-rent plan will be able to afford the rent. If only a few homeowners can afford the rent, then only a few homeowners will file an own-to-rent petition. I also agree with some of item 8 -- banks/servicers shouldn't bear all the costs of transitioning from a mortgagor-mortgagee relationship to a landlord-tenant relationship. (e.g., hiring a rental property manager). The costs should either be shared by both parties, or borne entirely by the homeowner. I disagree, however, with the following: Item 1: Determining the fair market rent of a house in a 90% empty subdivision is obviously difficult, but there's a reason for that. If state law requires a minimum number of sales to create a homeowners' association (most states don't), and there haven't been enough sales, then the appraiser will determine the fair market rent under the assumption that the restrictive covenants aren't applicable to the unsold houses. In other words, the appraisal will be made with the assumption that the house isn't part of a homeowners association. Item 2: I don't understand why McArdle thinks this problem is so insurmountable. Servicers could easily be required to hire rental property managers to serve as landlords. As I stated above, I'd have no problem with forcing the homeowners to bear some of these costs. As for the legality of servicers becoming rental agents, that's a purely contractual issue. Contracts can be altered. Homeowners also have no legal ability to become renters under their contracts, but the whole point of the own-to-rent plan is to allow judges to alter their contracts. The own-to-rent plan could just require judges to also alter the terms of the contract to allow mortgage services to become rental agents. Item 3: Yes, there will be considerable political pressure on the independent appraisers to screw the banks, but that's why they're independent appraisers. Items 6 & 7: If an area truly doesn't have adequate services (or the tax base to support adequate services), then homeowners in that area won't petition the judge to let him stay there as renters. The "undeveloping" areas will thus be allowed to undevelop. The government wouldn't be encouraging peope to do the wrong thing -- allowing homeowners to stay in undeveloping areas isn't the same thing as encouraging them to stay there. The government also wouldn't be "making" people less mobile; people would be choosing to become less mobile. As I noted at the outset, I think rent-to-own is a good idea, in the sense that it gets the incentives right. It's possible that there are problems with implementation that are big enough to make the whole plan not worth it. But I haven't seen a problem that's a deal-breaker just yet. A presidential candidate should be selecting a vice president on the basis of who can help him govern successfully and get him re-elected. Let me get this straight: A vice presidential candidate should help the presidential candidate govern and win elections? That's cutting-edge analysis! The synchronised jump in global food prices suggests that there is more to the story than disruptions to supply. Prices are also rising partly because loose monetary conditions in emerging economies have boosted domestic demand. These economies have accounted for over 90% of the increase in global consumption of oil and metals since 2002 and for 80% of the rise in demand for grain. This partly reflects long-term structural forces, but it is also the product of a money-fuelled cyclical boom. ... [T]he initial shock to food prices may have come from the supply side, but the strength of income and money growth helps to validate higher prices. Were monetary conditions tighter, rises in food prices might be offset by declines elsewhere, keeping inflation under control. ... Analysis by Goldman Sachs, for 1990-2007, confirms that in emerging markets, higher food prices did seem to push up other prices. In most developed economies the link from food to non-food inflation was statistically insignificant. Besides the larger share of food, this has two causes: central banks' credibility is weaker in most emerging economies, so that inflation expectations are less firmly anchored; and real wages tend to be less flexible. Both increase the risk of a price-wage spiral. ... 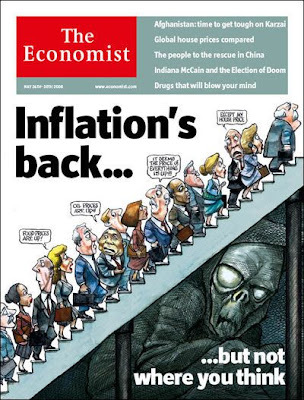 Inflationary expectations are rising and workers clamouring for pay increases. In a survey of inflation expectations in Argentina, the average reply for the next 12 months was 36%. Russian wages are rising at an annual rate of almost 30%. ... 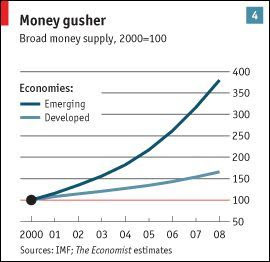 The broad money supply has grown by an average of 20% over the past year in emerging economies, almost three times the pace in the developed world (see chart 4). Russia's money supply has swelled by fully 42%. China has helped to hold down inflation in developed economies because its goods are much cheaper and they are gaining market share, replacing more costly goods. This will remain true for many years. Competition from China also forces local producers to cut their prices and it curbs wage demands in rich countries. As China moves up the value chain it will pull down the prices of a wider range of products. In other words, China will continue to help hold down global prices—although possibly by less than in the past. If China will pull down the prices of more products in the future, then why would it be holding down global prices "less than in the past"? You could argue that as China moves up the value chain, the products it will make are less likely to be included in the CPI (or other baskets), and thus the prices China will be holding down won't show up in inflation. But I don't think that's what the author was arguing. Am I missing something here? [A] large portion of the effect of homeownership on...investments [in social capital] comes from lower mobility rates for homeowners. ... The most important effect of homeownership may be its role in increasing community tenure. The results confirm that homeownership works both directly and indirectly through lowering the probability of changing residence. Between 4 and 92 percent of the effect of homeownership on citizenship is operating primarily because homeownership is associated with lower mobility rates. This finding suggests that policies that act to limit mobility would end up having similar effects to homeownership-enhancing policies on increasing the level of investment in local amenities and social capital. The length of tenure and the homeowning variables interact with each other, so that longer tenure mitigates the adverse effect of renting on the probability that youths stay in school. The average tenure of homeowners is roughly 11 years, so giving renters the right to rent the property for up to 20 years essentially allows them to stay in the community for just as long as homeowners. And if the renters under Grijalva's plan are equivalent to homeowners in terms of tenure, then communities will receive most of the same benefits from the renters that they would have received if the renters were homeowners. In other words, the own-to-rent plan would preserve most of the vaunted benefits of homeownership for the surrounding community. Developing countries currently face higher rates of inflation not because of poorer macro-management, but because oil and food prices are soaring, and these items represent a much larger share of the average household budget than in rich countries. [I]nflation in the general price level is a result of there being more money than demand for money. Sudden scarcity--which is what higher food and energy prices represent--results in a shift in the relative value of everything in the economy. The problem with this argument is that higher food and energy prices aren't always the result of sudden scarcity. Higher food and energy prices are sometimes the result of inflation, and sometimes the result of sudden scarcity. It's true that the Fed pays more attention to core inflation -- which excludes food and energy prices -- than headline inflation, but the Fed also hasn't adopted strict inflation targeting. Ultimately, I think Stiglitz and McArdle are probably both right in a sense. 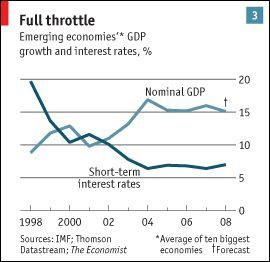 Stiglitz is right that inflation targeting is inappropriate as a one-size-fits-all rule, and is especially inappropriate for developing countries. Firms with sufficient market power can raise prices above marginal cost, and firms are much more likely to have sufficient market power in developing countries (because markets in developing countries tend to be thin). When higher prices are the result of this kind of mark-up, then the price level and the output gap are moving in opposite directions. In this scenario, inflation targeting would prevent the central bank from achieving a stable output gap. However, McArdle is right that inflation targeting isn't always and everywhere a bad idea. As always, context is king. Crude oil fell more than $2 a barrel on signs that a 15 percent increase in prices this month isn't justified by stockpiles and demand. Consumption averaged 20.3 million barrels a day in the past four weeks, down 1.3 percent from a year earlier, the Energy Department said yesterday. Prices climbed above $135 a barrel today as OPEC ministers said they could do nothing to prevent higher prices because they are pumping at capacity. "The fundamentals justify a price between $80 and $100," said Sarah Emerson, managing director of Energy Security Analysis Inc., a consulting firm in Wakefield, Massachusetts. "The run-up in prices has more to do with institutional investors coming into the market. There's nothing to discourage them from doing so because the returns have been so high." ... "Even a bull market has to consolidate at some point and it looks like that's what's happening today," said Addison Armstrong, director of market research at TFS Energy LLC in Stamford, Connecticut. Here's how I see it now: 1. Supply and demand could justify high oil prices, in that China and India are definitely consuming more oil, and supply has stalled because there have been fewer major oil discoveries. 2. The measure we usually use to determine whether there's a bubble in a commodity (inventories) doesn't point to an oil bubble. To me, that doesn't warrant the conclusion that there isn't an oil bubble. Remember, there's not conclusive evidence that fundamentals are driving oil prices either, there's just a plausible story that could explain the high oil prices. Moreover, the fact that a very basic measure suggests that there isn't an oil bubble doesn't prove that there isn't actually an oil bubble. The absence of conclusive evidence for a proposition doesn't disprove the proposition. It just means there isn't sufficient evidence to prove the proposition. Frankly I think most of the debate boils down to different definitions of what constitutes a "bubble." Those who argue that there is an oil bubble tend to take a short-run view of bubbles -- they ask whether today's price of crude oil is justified by supply and demand. Conversely, those who argue that there isn't an oil bubble tend to take a long-run view of bubbles -- they ask whether high oil prices in general are justified by supply and demand, and are less concerned with day-to-day oil prices. The two sides may just be talking past each other. According to the NPR story, there are roughly 30,000 dry cleaners in the U.S., and on average, each pays an additional $4,000 per year due to the hanger tariff. This indicates an average annual cost of 30,000 firms x $4,000 per firm = $120 million. According to the U.S. International Trade Commission's report, U.S. employment in wire hanger manufacturing was 564 workers in 2004 and fell to 236 workers by 2006. Let's assume that employment in this sector would have fallen to zero in the absence of the tariff, and that with the tariff, employment will recover to 2004 levels. In other words, assume the tariff "saves" 564 jobs. Dividing the cost of the tariff to U.S. dry cleaners ($120 million year) by the number of jobs saved (564 jobs) indicates that each job saved costs about $212,765 per year. Keep in mind that the typical full-time worker in this sector earns about $30,000 per year. Even if we assume that industry employment doubles, the cost of the tariff is still roughly $120,000 per job. That's right, we're paying $212,765 per year to save $30,000 per year jobs. Incredible. But what may be even more incredible is that an industry with only 236 workers was able to wield enough influence to secure such an expensive tariff. I know public choice theory is particularly applicable when it comes to the U.S. tariff schedule, but jeebus! 236 workers! As an economic historian, I cannot but think back to the origins of the welfare state, which occurred at the end of the first great globalization of 1840-1914. In several recent articles, Michael Huberman has convincingly shown that if anything trade and government intervention were positively related during the late 19th and early 20th centuries. For example, a range of labour market regulations was introduced across Europe, prohibiting night work for women and children, prohibiting child labour below certain ages, and introducing factory inspections. The period also saw the widespread introduction of old age, sickness and unemployment insurance schemes. Crucially, this "labour compact" as Huberman calls it was more advanced in those countries which were more open to trade. There is no evidence of a race to the bottom here: rather, governments in Belgium and elsewhere used the introduction of such reforms to secure the support of workers for free trade. The problem I have with this argument as it's applied today -- that we should secure support from unions for freer trade by giving them domestic concessions -- is that the trade-off may not be worth it anymore. Some level of government intervention is efficient; even Martin Feldstein supports the existence of mandatory Unemployment Insurance. Establishing a UI system in exchange for freer trade is thus a win-win from an efficiency standpoint. But what if unions demand a massive and ultimately inefficient expansion of the UI system in exchange for supporting marginally more liberalised trade with China? Then the argument becomes quantitative: are the gains from more trade with China greater than the costs of a bloated UI system? It's no longer a win-win. The current version of this argument seems to assume either that the domestic concessions are efficient standing alone, or that their inefficiencies are tiny compared to the efficiency gains from freer trade. That won't always be the case. The efficiency gains from freer trade are subject to diminishing returns -- as world trade slowly becomes more free, the efficiency gains from further trade liberalisation become progressively smaller. The domestic concessions used to secure support for freer trade are not subject to diminishing returns. Unless politicians progressively scale down the size of these domestic concessions (highly unlikely), then using domestic concessions to secure support for freer trade may well prevent the world from getting to a state of free trade. The inefficiencies of the domestic concessions will eventually outweigh the efficiency gains of further trade liberalisation. To be clear: I'm not arguing that we're in this position now. Not even close. I'd support significantly more transition assistance for displaced workers, among other reforms. But I'm wary of the argument that the ticket to a state of free trade is domestic concessions. The United States faces serious long-run budgetary challenges. If action is not taken to curb the projected growth of budget deficits in coming decades, the economy will eventually suffer serious damage. The issue facing policymakers is not whether to address rising deficits, but when and how to address them. At some point, policymakers will have to increase taxes, reduce spending, or both. Much of the pressure on the budget stems from the fast growth of federal costs on health care. So constraining that growth seems a key component of reducing deficits over the next several decades. A variety of evidence suggests that opportunities exist to constrain health care costs both in the public programs and in the health care system overall without adverse health consequences. Fixing healthcare is clearly the answer to Mark Thoma's question about what you would do with one wish. A close runner-up would be wholesale adoption of school vouchers. Well, maybe not wholesale adoption of school vouchers, but some sort of market-based overhaul of the public education system. No other issue even comes close to healthcare and education in terms of overall importance. One possible explanation is that the market has kept learning about the strength of demand and the weakness of supply over the years. It is consistently being surprised, in other words. That may be right, but it is a shaky argument: why is the market always being surprised in the same direction – that excess demand is greater than we thought? Another story that I think makes some sense is the one that Jeffrey Frankel and Jim Hamilton have promoted – that Fed monetary policy has played a role. [A] drop in real interest rates should cause commodity prices to rise. But here again, the decline would also have to be unanticipated to explain the continual increase in the price. I think there is a lot of truth to the view that markets keep getting surprised in the direction that makes oil prices higher. ... The problem for economists is that the market for oil is so complicated that we cannot very accurately calculate what the price of oil “should be” if there is no bubble. We have to read the entrails to figure out whether the price is really reflecting market fundamentals – demand, supply, real interest rates – or has a bubble component. As I look at the rising price, I wonder which story is most plausible: (1) the markets have been surprised over and over about demand by end users and production capabilities; (2) markets have been surprised over and over about how low real interest rates are; (3) there is a bubble. These stories may go together, in fact. "If nothing else, the deal illustrated the kind of competition Argentina is likely to come up against this season in emerging markets like Egypt." "Hedge fund strategies currently in favor with European investors are at opposite ends of the return/risk spectrum, notably emerging markets are on one end and market neutral equity strategies at the other end." This is the earliest mention in the LEXIS database. So thank you, Infovest21! Rising prices and a widespread bull market in commodities should indicate that there is a growing scarcity of hard assets. However, traditional forces of supply and demand cannot fully account for recent prices. To be precise, the normal price-inventory relationship has been altered. This is the assertion of an expanding list of bona fide hedgers, commodity professionals and economists. Specifically, dynamics have changed because securitized commodity-linked instruments are now considered an investment rather than risk management tools. Of late, this has been causing a self-perpetuating feedback loop of ever higher prices. In a slowing global economy hit by a major credit crisis and reeling from a falling dollar, it is likely that money flows seeking safe haven in hard assets is the key driver of recent volatility. Futures and forward contracts are intrinsically different instruments than securities which are derived from the capital markets (e.g., fixed income or equities). This is underappreciated. Derivatives are risk management tools, a “zero-sum game,” fundamentally different from the “rising tide raises all ships” concept of the capital formation markets. While there is an established theoretical basis and considerable empirical evidence that link investment in capital market assets to positive expected returns over time, notwithstanding the recent surge in commodity prices, the same cannot be said about commodities. As noted by Greer (1997), the inherent problem is that commodities are not capital assets but instead consumable, transformable and perishable assets with unique attributes. Hence, speculative trading, by definition any commodity trading facilitated for financial rather than commercial reasons, likely results in “zero systematic risk.” The conundrum is that for every buyer of a futures contract there is a seller—sine qua non, there is no intrinsic value in futures/forward contracts—they are simply agreements which commit a seller to deliver an asset to a buyer at some place/point in time. On the whole, I found Frankfurter's argument pretty persuasive. While I don't think the "financialization" of commodities is the sole driver of the commodities boom by any stretch of the imagination, I'm ready to assign it a decent role. The US Department of Agriculture revealed on Friday that the US biofuel industry would consume one third of the country’s corn crop in the 2008-09 season – or 4bn bushels – up from about 22 per cent a year earlier – or 3bn bushels. I spent 2 incredibly frustrating hours late Wednesday night trying to find a good estimate of how much ethanol will consume this year's U.S. corn crop -- including about 45 minutes on the Department of Agriculture's website -- and the Department of Agriculture reveals its estimate 2 days later? Wow. Not funny. At all. On Wednesday, I had to go to footnote 16 in Appendix 1.2 of the IMF's 2008 World Economic Outlook to find the answer. On Saturday, the answer is on the front page of the FT. I really hate the Department of Agriculture. Of course, even with energy's smaller role in the production of output, any rise in oil prices to over $200 a barrel in the next few years would have serious disruptive effects on the world economy. To many persons who have commented on this prospect, such a high oil price seems plausible, given the expected continuation of the rapid growth in the GDP of China, India, Brazil, and other major developing countries. For the evidence is rather strong that the short run response of both the supply of and the demand for oil to price increases is rather small. The small elasticity of both the supply and demand for oil explains why the moderate reductions in world oil supply during the earlier price spikes, and the moderate increase in world demand during the current price boom, produced such large increases in price. However, the long run response to price increases of both the demand and supply for oil and other energy inputs is considerable. For example, given enough time to adjust, families react to much higher gasoline prices by purchasing cars, such as hybrids and compacts, that use less gasoline per mile driven. They also substitute trains and other public transportation for driving to work and for leisure purposes. High energy prices, and hence the opportunity for large profits, induce entrepreneurs to work more aggressively to find fuel-efficient technologies, including the use of batteries as a replacement for the internal combustion engine. Given that we can easily reduce consumption when costs go up, a permanent doubling of the prices of food and energy would reduce income by less than 6%. At current rates of economic growth, incomes would recover from such a shock in less than three years. Call me crazy, but I think a permanent doubling of food and energy prices would slow our rate of economic growth pretty significantly. How long it would take incomes to recover "at current rates of economic growth" is irrelevant when the doubling of food and energy prices would lower the rate of economic growth. Mr Glauber [chief economist for the Department of Agriculture] said that ethanol was likely to consume 24 per cent of the maize harvest. Biofuel demand has propelled the prices not only for corn, but also for other grains, meat, poultry, and dairy through cost-push and crop and demand substitution effects. "[A]s long as the music is playing, you’ve got to get up and dance. We’re still dancing,” he said in an interview with the FT in Japan. Unfortunately, the quality of SIV ratings differs from the quality of ratings of regular corporations. A AAA for a SIV is not the same as a AAA for Microsoft. And the market was not fooled. After all, why would a AAA-rated SIV earn 200 basis points above a AAA-rated corporate bond? One cannot escape the feeling that many players understood what was going on but happily went along. Mr. Frank’s bill is part of a package that also includes two major housing measures that the White House has been demanding for months: an overhaul of the Federal Housing Administration and tighter regulation for the government-sponsored lenders Fannie Mae and Freddie Mac. In its statement of opposition, the administration said it viewed the inclusion of those provisions as “largely symbolic” and called on Congress to pass those bills as independent measures. OK, I'll bite: If the provisions overhauling the FHA and the GSEs are just "symbolic," then why would you want Congress to pass them as independent measures? Calling for provisions of a bill to be passed as independent measures is supposed to signal support for those provisions. But the provisions overhauling the FHA and the GSEs would still be "symbolic" as independent measures. So why disparage provisions and simultaneously call for them to be passed as independent measures? This issue goes well beyond economics to questions of political economy and political philosophy. If you think it is the job of government to take from Peter to pay Paul, and if Peter can move around the globe, then you need international tax cooperation. Otherwise, some countries will become nations of Peters, leaving all the Pauls to fend for themselves. On the other hand, if you think that the main job of government is to facilitate voluntary exchange by protecting property rights, rather than re-slicing the economic pie as it sees fit, then tax competition is a good check against excessive interventionism. In other words, are you more worried about too little government or too much? Or maybe you think it's the job of the government to not only facilitate voluntary exchange by protecting property rights, but to do other stuff too (like, say, provide for a national defense, or put murderers in prisons). And maybe, just maybe, the government needs money to do some of that other stuff. Now I don't want to get too crazy here, but maybe the best way to collect the money -- dare I say the most efficient way? -- is through a system of progressive taxation. Of course, then the government would be protecting property rights and "tak[ing] from Peter to pay Paul." What a weird world that would be! Luckily, we don't have to worry about the implications of international tax competition in such a world, because that world obviously doesn't exist. But pretend for a moment that such a world does exist: that governments both protect property rights and take from Peter to pay Paul. Then some countries would still become nations of Peters, leaving all the Pauls to fend for themselves (because the Peters would leave any country that slices the economic pie). That would make it impossible for countries of Pauls to have an efficient system of progressive taxation, seeing as they would lose all vertical efficiency in their tax codes. Is it possible, then, that all-out international tax competition might not be such a hot idea? Nah. We better stick with the "slicing-the-economic-pie vs. growing-the-economic-pie" example. It's much more realistic that way. ...communism caused the subprime crisis! So goes the logic of Gerald O'Driscoll, in an essay for Reason magazine. The pricing of these financial products was the product of complex economic models, not the outcome of market transactions. As the value of the underlying homes and mortgages declined, pricing of the financial exotica became nearly impossible. ... There is a wonderful parallel here to the collapse of the Soviet Union. As the great Austrian economist Ludwig von Mises argued almost 100 years ago, central planning inevitably fails because there are no market prices to allocate resources. Market prices can only be the outcome of actual market transactions among buyers and sellers. Planners used mathematical formulas to value resources, especially capital. Now Wall Street wizards have imported Soviet thinking to allocate financial capital. Is it any wonder that it failed? The second factor contributing to the housing market collapse was the federal government’s commitment to “affordable housing.” Lenders, especially Fannie Mae and Freddie Mac, were pressured into promoting housing to low-income groups that could not qualify for normal loans. That policy is predicated on the belief that there is an underserved group of people who, but for economic discrimination or some other market failure, would be homeowners. The CRA was enacted in 1977. So how did the CRA not cause a subprime crisis for 25+ years, and then suddenly cause one in 2006? Keep in mind that the CRA doesn't actually require banks to lend to low-income or minority groups, and that it was significantly weakened in 2005. Believe it or not, not every bad thing is caused by "government interference" in the market. I swear, it's true. OK, so here's the tally: A liberal president (if you can define Truman as "liberal") asserted the unitary executive theory, and a liberal Supreme Court immediately rejected said theory. A conservative president (Reagan) then asserted the unitary executive theory for eight years. Finally, George W. Bush "intensified" the unitary executive theory. Will's conclusion: The unitary executive is a liberal theory. Makes sense. If there was a Special Olympics for Columnists, Will would be standing on a podium right now. Between 2000 and 2007, house prices increased an average of more than $275,000 compared to incomes (house price to household income ratios) in the 10 markets with the greatest price escalation or the greatest affordability loss. Among the second 10 markets with the greatest affordability loss, prices rose $135,000 relative to incomes. By contrast, in the markets with the least affordability loss, house prices increased only $5,000. What the 20 markets that have lost the most affordability have in common is excessive land use regulation. First, local currencies blossom when the nominal money supply is too low and wages and prices are sticky downwards. A boost in the real money supply is needed and the private sector will do it -- albeit at high transactions costs -- even if the government will not. That's why so many of these local currencies blossomed in the 1930s but then disappeared. They did good but then they were stamped out or ceased to be necessary. It's true that a boost in the real money supply is needed when the nominal money supply is too low and wages and prices are sticky downwards, but should that boost come in the form of local currencies or the government currency (i.e. dollars)? Cowen believes the government will be too slow in boosting the real money supply -- the community might need a boost in its real money supply now, but it'll take around 6 months for a cut in the Fed funds rate to reach the community. A local currency could fill in for dollars while the community waits for the Fed's rate cut to take effect. But how much of the local currency should be printed? It's impossible to know ex ante how much a Fed funds rate cut will increase the money supply in a specific community, because the money has to work its way through the money multiplier. Presumably the community would forecast how much a Fed funds rate cut would increase its money supply, and price its local currency accordingly. But do we really trust local communities to accurately predict the amount that a Fed funds rate cut will increase the community's real money supply? There's a good chance the community will overshoot in one direction or the other, and I think the costs of overshooting will outweigh any benefits accruing to the community from an immediate boost in the money supply. Also, how will the community know when the local currency has ceased to be necessary? The process of fazing out a local currency would necessarily be governed by guesswork and intuition (not to mention currency arbitrage), and the inefficiency of such a process would also reduce the net efficiency of the local currency. On balance, I don't think the marginal benefit of an immediate boost in the community's real money supply would outweigh the real administrative costs. Globalization is real and important. It’s just not the central force driving economic change. Some Americans have seen their jobs shipped overseas, but global competition has accounted for a small share of job creation and destruction over the past few decades. Capital does indeed flow around the world. But as Pankaj Ghemawat of the Harvard Business School has observed, 90 percent of fixed investment around the world is domestic. Companies open plants overseas, but that’s mainly so their production facilities can be close to local markets. Nor is the globalization paradigm even accurate when applied to manufacturing. 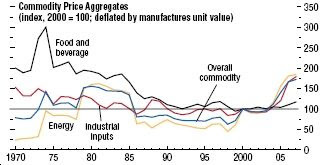 Instead of fleeing to Asia, U.S. manufacturing output is up over recent decades. As Thomas Duesterberg of Manufacturers Alliance/MAPI, a research firm, has pointed out, the U.S.’s share of global manufacturing output has actually increased slightly since 1980. Even under the dubious assumption that "share of global output" is the proper way to measure the impact of globalization, the fact that the U.S.'s share of global manufacturing output has increased proves absolutely nothing about globalization. The proper question would be whether the U.S.'s current share of global manufacturing output is higher or lower than it would have been in the absence of globalization. If it's lower, then the U.S. has lost jobs due to globalization. This is a bit like the supply-siders' argument that the Bush tax cuts paid for themselves because tax revenues are higher now than they were before the tax cuts. That also proves nothing, as the proper question is whether tax revenues are higher now than they would have been in the absence of the tax cuts. David Brooks doesn't understand this. And yet some people consider him a "thinking" Republican. That makes me sad.